Q. I found a single-piece sound system on Amazon called the Boytone B-22M for $119. It has the ability to convert vinyl, cassette tapes, and CDs to MP3 and put it on a flash drive, offering even more capability (adding cassette and vinyl) than the Teac CD player you recommended recently. What is your opinion of this system? Good, just OK, or not good will suffice. A. Systems like the Boytone B-22M are relatively common, and though I have not tried that specific unit I have spent a little bit of time with others. Your answer has two parts. For converting cassettes and CDs to MP3s, it would rate as “just OK.” The sound quality of the conversions would be middle-of-the-road at best, and for many people that may be sufficient. For converting vinyl, or even playing it over the speakers I would rate it as “not good” and I would not recommend the system for that purpose. A common characteristic of almost all of these inexpensive all-in-ones share is they use ceramic phono cartridges with poor quality needles to pick up the sound from the record. These record players do not sound very good, and the ceramic cartridges with cheap needles can quickly cause audible damage to your records. 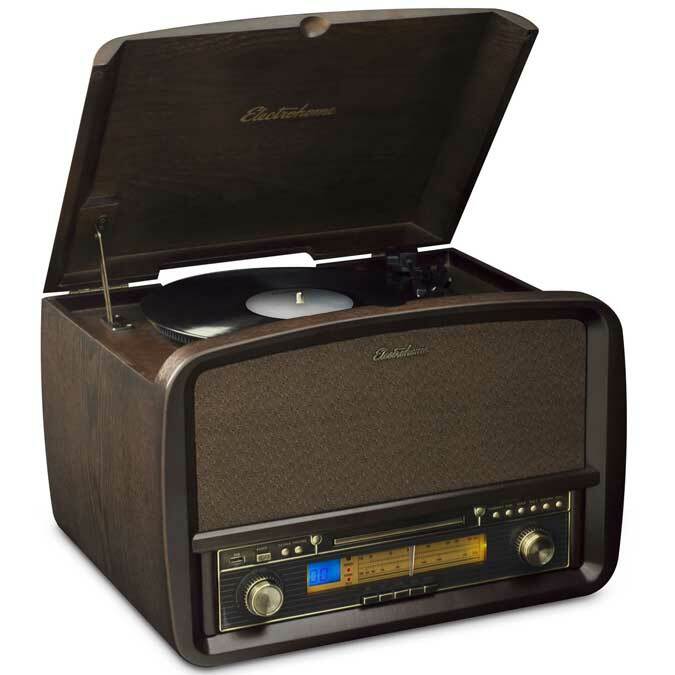 Electrohome makes a similar model called the Signature Retro Music System that has a ceramic cartridge they claim will not harm records, due to its conical sapphire stylus (needle.) I have not tried it myself, but the parent company is very reputable (they own Fluance as well) so I am willing to give them the benefit of the doubt for now. The unit has a 4-star rating with over 1,000 reviews on Amazon, so customers seem to be pretty happy with it, especially for the sound quality playing CDs and FM radio. It does not have a cassette player, though. It has standout good looks, resembling a classic tabletop console record player in real wood with amber lighting and an antique patina faceplate. If I needed something like this, it is the one I would buy for the style alone! Q. I read your columns about cars without CD players, and how to transfer your music from CD to flash drive for use with the car’s USB port.Stop already! Why succumb to the idea to that you can’t have what you really want? The automotive industry is built on the idea that they can provide more of what their customers want than the competition, and earn the sale. Well, if the customer wants a CD player, they should buy a car with a CD player as plenty of them still exist. If I can’t play my CDs, well, there’s other cars on the market. I buy what pleases me. Don’t encourage the digital idiots- please. A. I received a lot of email about car CD players and transferring media to USB, and your email made me wish you were in my office when I read it, so I could give you a high five. That’s a great answer! It may have been a little bit late for my original correspondent who already had a new car, but it is good advice to those who are car shopping who want a CD player. If you don’t like what you see, keep looking. The best way to fight the ongoing de-contenting in the marketplace is to refuse to go along with it, by buying something else.